In August 1896, three people led by Skookum Jim Mason (a member of the Tagish nation whose birth name was Keish) headed north, down the Yukon River from the Carcross area, looking for his sister Kate and her husband George Carmack. 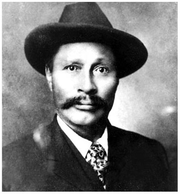 The party included Skookum Jim, Skookum Jim’s cousin known as Dawson Charlie (or sometimes Tagish Charlie) and his nephew Patsy Henderson. After meeting up with George and Kate, who were fishing for salmon at the mouth of the Klondike River, they ran into Nova Scotian Robert Henderson who had been mining gold on the Indian River, just south of the Klondike. Henderson told George Carmack about where he was mining and that he did not want any “Siwashes” (meaning Indians) near him. The group then headed a few miles up the Klondike River to Rabbit Creek (now Bonanza Creek) to hunt moose. On August 16, 1896, the party discovered rich placer gold deposits in Bonanza (Rabbit) Creek. It is now generally accepted that Skookum Jim made the actual discovery, but some accounts say that it was Kate Carmack. George Carmack was officially credited for the discovery because the “discovery” claim was staked in his name. The group agreed to this because they felt that other miners would be reluctant to recognize a claim made by an Indian, given the strong racist attitudes of the time. Miners wait to register their claims. miners who had been previously working creeks and sandbars on the Fortymile and Stewart Rivers. Robert Henderson, who was mining only a few miles away over the hill, only found out about the discovery after the rich creeks had been all staked. News reached the United States in July 1897, when the first successful prospectors arrived in San Francisco on July 15 and in Seattle on July 17, setting off the Klondike stampede. In 1898, the population in the Klondike may have reached 40,000, which threatened to cause a famine. Most prospectors landed at Skagway, Alaska, or the adjacent town of Dyea, Alaska, both located at the head of the Lynn Canal. From these towns they traveled the Chilkoot Trail and crossed the Chilkoot Pass, or they hiked up to the White Pass into the Yukon Territory and proceeded thence to Lake Lindeman or Lake Bennett, the headwaters of the Yukon River. Here, some 25 to 35 grueling miles (40 – 56 km) from where they landed, prospectors built rafts and boats that would take them the final 500-plus miles (800-plus km) down the Yukon to Dawson City, near the gold fields. Stampeders had to carry a year’s supply of goods — about a ton, more than half of it food — over the passes to be allowed to enter Canada. At the top of the passes, the stampeders encountered a Mountie post that enforced that regulation. It was put in place to avert shortages like those that had occurred in the previous two winters in Dawson City. Miners and prospectors ascend the Chilkoot Pass. The climb to the Chilkoot Pass was steep and hazardous, rising a thousand feet in the last half mile (300 m in 800 m). It was too steep for pack animals, and prospectors had to pack their equipment and supplies to the top. Some 1,500 steps were carved into the ice to aid travel up the pass. Even though it was not as high, conditions on White Pass were even worse. It was known as the Dead Horse Trail, since about 3,000 animals died along the route. Others took theCopper River Trail or the Teslin Trail by Teslin Lake, and some used the all-Canadian Ashcroft (the Edmonton trails. The other main route was by steamer about 1,600 miles (2,600 km) up the Yukon River. In 1897, many using this route late were caught by winter ice below Fort Yukon, Alaska, and had to be rescued, but use of this route was implicit in the discovery of gold finds at Nome and St. Michael near the Yukon estuary, and at Fairbanks, Alaska. An estimated 100,000 people participated in the gold rush and about 30,000 made it to Dawson City in 1898. By 1901, when the first census was taken, the population had declined to 9,000. Throughout this period, the North West Mounted Police, under the command of Charles Constantine and his more famous successor, Sam Steele, maintained a firm grip on the activities of the prospectors to ensure the safety of the population as well as enforcing the laws and sovereignty of Canada, strictly policing the entry of weapons into the territory and requiring all those transiting White Pass or Chilkoot Pass to be carrying sufficient goods to survive. As a result, this gold rush has been described as the most peaceful and orderly of its type in history. The effectiveness of the Mounties in this period made the police force famous around the world and ensured the survival of the organization at a time when its continued operation was being debated in the Canadian Parliament. In 1898, there was a call to women to join the Victorian Order of Nurses’ Klondike contingent. Candidates had to be unmarried, at least twenty-eight years old, and be a graduate of a recognized nursing school. They were warned they would have to dress very plainly and not curl or crimp their hair. Four nurses were selected, three Canadians and one recent immigrant from England. They reached Dawson one month after the Sisters of St. Ann and found their skills desperately needed to care for the many victims of the typhoid fever epidemic that was raging through the Klondike. For a few short years, Skagway, Alaska (the main “Yukon Port”) and Dawson City were on the world’s “Grand Tour”, an around-the-world circuit of the wealthy and those who entertained them; musicians and other artists of the stature of Anna Pavlova made the long journey to visit the city where the streets were virtually paved with gold (claims staked on the gravel pits used to pave downtown Dawson have been found to have a higher percentage of gold in them than operating claims). The Klondike field continues to be worked today, although most of the original deposits were removed in the early 1900s when small claim holdings were consolidated and were worked by large-scale industrial extraction methods, notably steam dredges. Among the many to take part in the gold rush was writer Jack London, whose books White Fang, The Call of the Wild, and “To Build A Fire”, a collection of short stories, were influenced by his northern experiences, and adventurer “Swiftwater” Bill Gates. Part I of Jack London’s 1910 novel Burning Daylight is centered around the Klondike Gold Rush. Another literary luminary connected with the rush, and whose cabin still stands in Dawson City, was folk-lyricist Robert W. Service, whose short epics “The Shooting of Dan McGrew” and other works describe the fierce grandeur of the north and the survival ethic and gold fever of men and women in the frozen, gold-strewn north. Service’s best-known line is the opening of “The Cremation of Sam McGee”, which goes “There are strange things done in the midnight sun by the men who moil for gold…”. One of the most thorough popular histories of the Klondike Gold Rush, titled simply Klondike, was written by Canada’s Pierre Berton, who was raised in the Yukon Territory. (In the United States, Berton’s book is entitled The Klondike Fever.) Berton covers nearly every misadventure of the nightmarish and harrowing journeys taken by the many parties on different routes bound for Dawson City, and also covers in fair detail the goings-on in that town up until about 1904. The Trail of ’98 (1928) and Mae West’s Klondike Annie (1936). The gold rush is an important event in the history of the city of Edmonton, which, until 2005, celebrated Klondike Days, an annual summer fair with a Klondike gold rush theme. During the rush, Edmonton was believed to be a viable departure point for travel to the Klondike and was heavily advertised as such by local merchants wanting to profit from people’s ignorance, but only a handful made it from that embarkation point long after the rush was over, because of the immense distance and subarctic travel conditions. The tenuous, and arguably fraudulent, connection of Edmonton with the Klondike Gold Rush was a source of much ridicule for years; its origin being but an attempt in the 1960s to imitate the burgeoning success of the Calgary Stampede by finding a historic event the city was in some way involved in to function as a theme. This finally lead to the renaming of the city’s annual summer exhibition in 2006 as Capital EX.